The first handheld hairdryer appeared on the market in 1925. It produced only 100 watts of heat and therefore did not have sufficient power to dry hair quickly. It weighed over 2 lb (1 kg) because it was made of heavy steel and zinc. Over the next 20 years engineers improved the design and managed to triple the heat output, raising it to 300 watts. By the 1960s, further improvements in electrical technology allowed the production of hairdryers with up to 500 watts of power. In the late 1970s, manufacturers began to focus on improving the safety of dryers. Early hairdryers were dangerous because if they accidentally came in contact with water they would short circuit and cause an electrical shock. There are hundreds of recorded cases of accidental electrocutions because a hairdryer was dropped into a bathtub or sink full of water while it was being used. In the late 1970s the Consumer Products Safety Commission (CPSC) recommended guidelines for hair dryer manufacturers to follow that would create safer products. The power of hair dryers was limited by the electric motors available. As smaller, more efficient motors were developed, greater airflow and greater heat output could be chieved. By the 1990s portable hairdryers could produce over 1500 watts of heat. Improvements in plastic technology and the discovery of new insulating materials made possible a new generation of lightweight hairdryers. Modern hair dryers can produce up 2000 watts of heat and can dry hair faster than ever before. One of the key factors to consider when designing a portable hairdryer is the amount of heating power it can produce. Since warm air is capable of absorbing more moisture than cold air, the temperature of the airflow is critical. By calculating the specific heat of the air and understanding the maximum temperature that can be used without burning the skin, engineers can calculate the amount of power required for the heating element. This ensures that the device will generate enough heat to dry the hair quickly. However, it is not enough to simply raise the temperature of the hair; the air must also pass rapidly through the hair for efficient moisture removal. Therefore, the efficiency of the fan is also a critical consideration. A hair dryer and its internal parts. 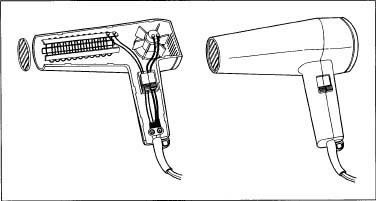 a Ground Fault Circuit Interrupter (GFCI), is used in modern hair dryers to prevent accidental electrocution. Other factors to consider include the weight of the unit and a user-friendly design. For the sake of convenience, hair dryers are designed to weigh only about 1 lb (500 grams), and they are made to be easy to handle during operation. Hairdryers are assembled from a series of components including the electrical motor, the fan blade, copper wiring, switching mechanisms, and various other electrical components. The plastics used to make the outside shell of the hair dryer must be durable, yet light-weight. The electric motor and fan blades arrive at the manufacturing plant pre-assembled. Hairdryers produce heat in the same fashion that a toaster does: by passing electric current through a wire. The wire has a high level of electrical resistance that causes it to generate heat as the current passes through it. Hair dryers use a metal heating element that is made of nichrome, an alloy of nickel and chromium. Unlike other electrical wires made of copper, nichrome will not rust at high temperatures. This wire looks like a coiled spring and may be up to 12 in (30 cm) long. It is wrapped around an insulating board so that the entire heating element is only a few inches long. The insulating board is usually made of mica, a mineral that can stand high levels of heat. Two flat pieces of mica several inches long are connected to form what looks like a three-dimensional "x." Notches are cut in the edges of this board such that when the nichrome wire is wrapped around the board it fits snugly into these slots. At the end of the wire there is a connection to the circuit that controls the power supply. Depending on how this circuit is wired, current can be fed to part of, or all of, the heating coil. More heat is produced as current is fed to a greater portion of the wire. The heating element used in modern hair dryers can produce up to 2000 watts of heat energy. The body of the hairdryer consists of a gun shaped plastic shell. This shell is divided into two sections to allow for easy assembly. The plastic parts are created by injection molding, a process that involves injecting hot, molten plastic (such as polypropylene) into a stainless steel die. After the mold is filled with hot plastic, cold water is circulated around the die to cool the plastic and make it harden. When the die is opened, the plastic parts are removed. One side of the plastic shell has a series of holes molded into it while the matching half has a series of short pins. These help align the two halves during manufacture and keep them firmly attached. The shell is molded with multiple compartments to hold the various electrical components. The handle of the gun contains the switch apparatus and the controls to operate the dryer. The electric motor and fan are found in the central part of the drier located just above the handle. The long barrel of the device contains the heating element. Next to the motor is an air intake air inlet. This inlet is covered with a fine mesh metal screen to prevent objects from accidentally getting caught in the fan blades. Some newer models even had a removable lint screen over the air inlet that can be taken off and easily cleaned. At the end of the barrel is another protective screen that prevents anyone from sticking their fingers or other long objects into the heating element. Other components of the hairdryer are designed to ensure its safe operation. Dryers contain a safety cut off switch that prevents the temperature of the drier from exceeding 140°F (60°C). This switch is a bimetallic strip, which is made from a sheet composed of two metals. These metals expand at different rates when they are heated. As the temperature inside the drier increases, the strip will bend one way or another as the metal strips expand at different rates. When a certain temperature is reached the strip bends to appoint where it trips a safety switch that cuts off the power to the drier. Another safety device is a thermal fuse built into the electrical circuitry. This fuse has a small metal strip that melts if the temperature of the circuit exceeds a certain amount. This breaks the circuit and instantly cuts power to the drier. Both these safety features are designed to prevent overheating and stop a fire from occurring. A third type of safety control is the Ground Fault Circuit Interrupter (GCFI) that is built into dryers to prevent electrocution, The GCFI senses how much current is flowing through the circuit and can shut it off if it detects a leak or a short-circuit. The dryer components can are put in place on an assembly line using a combination of automated equipment and manual labor. First, the electrical components are fitted into the bottom half of the plastic shell. Once this step has been completed, the top half of the shell is locked into place. These pins and holes are lined up when the shell hands are assembled. Screws and other fasteners are used to anchor the plastic parts together and hold them in place. Early hair dryers used dozens of screws to lock the shell hands to place. Because of more efficient designs, modern models only require a few key screw components. This helps control cost and reduce assembly time. After assembly warning labels showing that the hair dryer should be kept away from water must be attached. These labels are attached to the cord as required by the Consumer Products Safety Commission guidelines. Once the dryers have been fully assembled they are boxed along with an instruction booklet and additional safety warning materials and are packaged for shipping. All electrical appliances may be dangerous if misused. Hair dryers are particularly dangerous because they may accidentally dropped into a sink or bathtub full of water. Therefore, special quality control precautions must be taken to reduce the chance of electrocution. Beginning in 1980, manufacturers were required to include a warning picture on hair dryers to show they should not be used near water. This warning label must be permanently attached to the drier cord. In 1985, manufactures began adding a polarized electrical plug that would help ground the appliance and prevent accidental shock. In 1991, products were required to have design feature that prevents the possibility of a short-circuit whether or not the device is turned on. Modern hair dryers use GFCI to prevent any power flowing into the device when a short-circuit is detected. By the year 2000, recorded deaths due to electrocution by hairdryer had already dropped to less than four a year, and it is anticipated that this additional safety feature will completely prevent accidental electrocutions once all the older hair dryer models have disappeared from the market. While the quality of portable hair dryers has improved over the last 70 years there has been little change to their fundamental design. The improvements that have been made have greatly enhanced the safety of the devices and have increased their power nearly 20 fold. It is unlikely that future dryers will be made much more powerful because they already produce close to the theoretical maximum amount of heat that the user can safely be exposed to without danger of burning their hair or skin. Other future design improvements seem more likely. Dryers can be made to run more quietly or to be easier to hold and operate. Some manufacturers are focussing on improving the appearance of their products and are attempting to please younger uses by making dryers in designer colors or with clear plastic. It is also possible that technological breakthroughs may make new types of hair dryers possible. In 2000, one manufacturer introduced a new ionic hair dryer which is claimed to use ions, electrically conductive chemical species, to evaporate water faster with less damage to the hair. At the time of this writing it is not yet known is this new type of hair dryer will be successful in the market place. Perhaps one of them most interesting areas for future development of hair dryers really has nothing to do at all with hair. Imaginative consumers have identified that hair dryers can be used for alternate functions such as removing chewing gum from hard surfaces and helping to dry nail polish. It remains to be seen if manufacturers will respond by marketing hair dryers modified for these special uses. Dalton, John W. The Professional Cosmetologist. New York: West Publishing Company, 1985. Do any of the materials which make a hairdryer help the Enviroment? What are the social and economic issues in the designing and use of the product?